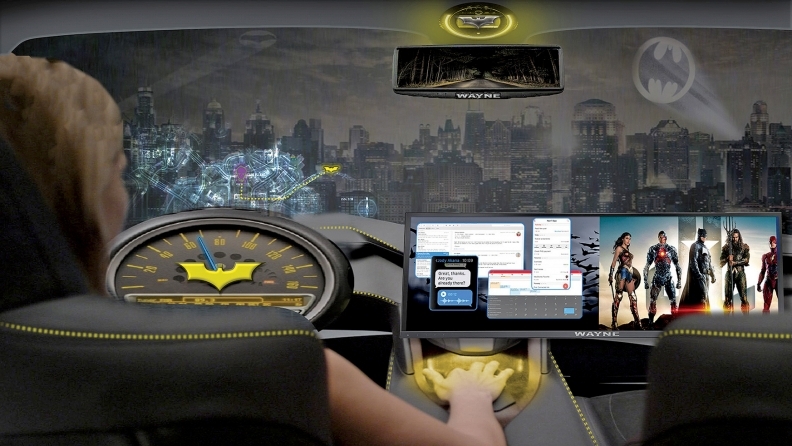 This rendering by Warner Bros. shows how its Intel partnership could result in an immersive superhero car ride. The race among carmakers to put fully autonomous vehicles on the road is poised to drive a competition of a different kind, as Hollywood revs up to jump deeper into the world of in-vehicle entertainment. It's a growing interest in what is likely to become one of the most sought-after spaces for viewers and eyeballs, after the auto industry transitions to an era in which commuters will need to pay far less attention to the road. And it will mean entertainment providers will have to change the way they make shows, requiring creators to come up with short-form story ideas that take into account the frequent stops made during a commute. "It has to be something that you can get in and out of very fast that still has a complete story," said Joseph C. Wilson, co-executive producer on the Showtime series "The Chi." "You don't want to be in some story that you have to pick back up after getting to your stop. You are going to have to find that episodic story that you can tell in a short period to be able to keep people's attention." The amount of time people spend watching TV and movies or playing games in the vehicle is expected to nearly double between 2030 and 2040. According to a 2017 report by Deloitte, by 2030 passengers are expected to consume 52 billion hours of media content annually. That is expected to go up to nearly 95 billion hours by 2040 as more people use self-driving vehicles. Kevin Westcott, vice chairman of U.S. media and entertainment at Deloitte, said some trends indicate a growing interest in the in-vehicle entertainment business. "There are a number of companies out there experimenting with shorter form content and others that are experimenting with other forms of advertising wrapped around that content," said Westcott. Warner Bros. was one of the first major entertainment companies to dive into in-vehicle entertainment, announcing a content partnership with Intel at the 2017 Los Angeles Auto Show. The collaboration included development of a proof-of-concept autonomous vehicle with immersive in-cabin experiences. Other entertainment companies spanning Amazon to Paramount Pictures have hinted that they are exploring ideas in the space as well. Chinese electric startup Byton, known for its 49-inch Shared Experience Display, plans to make premium in-vehicle entertainment a major part of its product strategy. "Byton's vision is to provide consumers with time to be in the car and enjoy themselves," said Abe Chen, Byton's senior director of cloud, connectivity, network and security. "We look at cars as the next smart mobile device, so we want to turn the car's interior into a digital lounge." Rewind, a London content studio that specializes in augmented and virtual reality technology, has been working with Lyft to create a new kind of in-vehicle experience that features interactive content developed around the shared-ride experience. Deloitte's Westcott said the growth of in-vehicle entertainment is only limited by how fast it takes self-driving vehicles to take over the car market. "As soon as I can turn my vehicle into a media delivery vehicle and not something that I have to drive, I start thinking about the screens I can have in there [and] how do I deliver the advertising, music and games and education," said Westcott. "But clearly my ability to do that on the media entertainment side is going to be made by the pace that we get to autonomous vehicles."